Join the discussion on our forums! Come discuss Masked Contender over in our dedicated Masked Contender discussion topic. Nice card , i'm glad i got it. It's good in mage or paladin secret deck . Wait, I don't get it. Does it generate an additional secret? Do you discover it? Do you draw and play it? Do you just get to play a secret from your hand for free? This wording is atrocious. The wording couldn't be more clear. What part about "PLAY a secret from YOUR DECK" do you not understand? Your brain is atrocious. Cast vs. play .... you cast spells, so I guess they thought that's more appropriate? Cool card with decent stats. 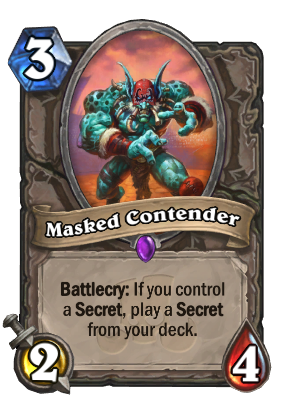 You just get a random secret from your deck played. Like Mad Scientist. At least that would be consistent. Does this card say "a copy", "discover" or "hand" on the text? Seems like someone just wants to whine about anything, even when it's self explanatory. There's consistency and there's functionality. Yes, this card and Mad Scientist (most likely) do the same thing. Could or should they have the same wording? Most likely yes. Is there a reason to go "OMG DO THEY EVEN KNOW HOW TO USE WORDS" on this one? Definitely no. Disclaimer: Good design isn't something I actively expect from this game, it just happens sometimes. Yes, there is a reason. Lesser Emerald Spellstone, it says PLAY a secret to upgrade. Same with Secretkeeper... It's a card game, I think wording is like, EVERYTHING in a card game. Paladin secrets are too bad to make it worth... this card is only worth it in Hunter or Mage. Rogue rarely wants two of the secrets, so that is the problem. “Who am I? ....” You know the rest. I dunno, d'you think it's any of our business?